The TiLite Twist children's wheelchair can generally be categorized as a pediatric wheelchair due to its small size. TiLite—the manufacturer of this product—specifies this wheelchair as follows. Seat Width (left-to-right) Adjustability: 2"
Seat Depth (front-to-back) Adjustability: 3"
This child-sized pediatric wheelchair is made to accommodate the growth that is typical among young children. For example, two inches of seat width adjustability (up to a maximum width of 15 inches) and three inches of front-to-back seat depth adjustability (up to a maximum depth of 16 inches) do not require the purchase of additional parts. Growth adjustability is built-in. The Twist's aluminum frame tubes are one inch in diameter. At the time of this writing Tilite's website specifies the Twist wheelchair weight — without the back wheels — as 12 pounds for a typical 16" x 16" chair configuration. However, neither the weight basis nor the 16" width is correct for the Twist wheelchair (the Twist cannot extend to 16" wide). This oversight has been reported to TiLite for their correction. The 12 pound weight basis of the TiLite Twist involves a 12" x 12" chair without rear wheels, not a 16" x 16" chair. 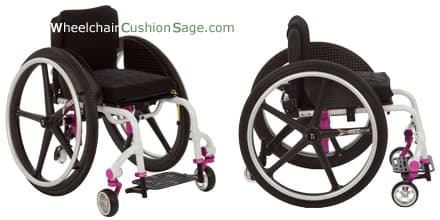 To order this wheelchair, carefully review the factory order form (linked in red above when available) and then contact Wheelchair Cushion Sage with your desired specifications. Note that the Wheelchair Cushion Sage price will be less than the price shown on the TiLite order form.